B « English Words of (Unexpected) Greek Origin. Beret (cap; earlier, berret) is from the diminutive form birretum of the Latin birrus (large hooded cloak). Its name derived from the red colour [burrus: red] of the wool of which it was made. Burrus is merely a transliteration of the Greek word pyrros [Gr: πυρρός] meaning red, the colour of the fire, from pyr [Gr: πύρ], fire. 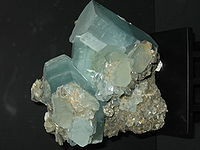 Brilliant comes from the French brilliant (sparkling, shining) from the Italian brillare (sparkle, whirl), from the Latin berillare (to shine like a beryl), from berillus (beryl, precious stone), from the Latin beryllus, which is a transliteration of the Greek beryllos [beryl, precious stone; Gr: βήρυλλος]. The word banjo (a stringed instrument with four or five strings, usually associated with country music) comes from the Portoguese bandurra, from the Latin pandura, which is a transliteration of the Greek pandura (a three-string instrument; Gr: παντούρα). The male proper name Basil is a transliteration of the Greek name Basilios, which derives from the word basileus (better pronounced as vasileus), which means king (βασιλεύς). The etymology of basileus is controversial. Most probably it consists of two words: (a) bas- (base; from the verb veno (βαίνω): go, move ahead – from which also comes the latin verb venire-) and (b) leus (leos -λεώς-: people – from which also comes the English word leity). So basileus (king) literally means the one who is based on the people*. 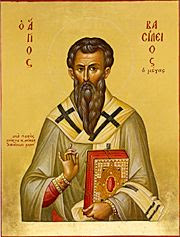 Saint Basil the Great (330-379) was archibishop of Caesarea in Cappadocia and one of the fathers of the Christian church. Icon of Saint Basil the Great. The name Basil was also borne by two Roman emperors, namely Basil I (867 -886) and Basil II (976-1025). Basile, Basilic, Basilides, Basiliki (fem), Basileios, Basilie, Basilio, Basilius, Bazeel, Bazeelius, Bazil, Bazyli, Vasile, Vasileos, Vasili, Vasiliki (fem), Vasilije, Vasilios, Vasilis, Vasilius, Vasilus, Vasily, Vassilij, Vassily, Wassily. English: basil (the herb), basilica, basilic. Το όνομα Basil προέρχεται από το ελληνικό όνομα Βασίλειος, το οποίο με τη σειρά του προέρχεται από το βασιλεύς. *: some say that basileus literally means the one that leads the people. 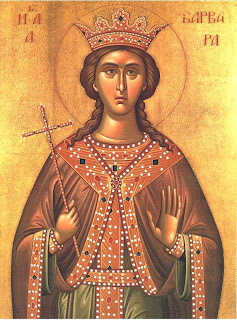 The Christian proper name Barbara is given in honour of the Great Martyr Saint Barbara (3rd century – December 4, 306). Saint Barbara was a young woman killed by her own father Dioscorus, who was then killed by a bolt of lightning. The name comes from the Latin barbarus, which is merely a transliteration of the Greek barbaros (βάρβαρος) meaning foreign, one who could not speak Greek, a non-Greek, an uncivilized. Other forms of the proper name. Barb, Barbie, Barbra, Babs, Bobbie, Barbora, Bairbre, Bara, Barbro, Basia, Borbala, Varvara, Varya. German: Barbar, Barbarei, barbarisch, Barbarismus. Etymology of fracture, fragile, fragment, fraction, break. Origin of fracture, fragile, fragment, fraction, break. 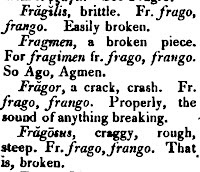 The word fracture (a breaking of a bone) comes from the latin verb frango/frangere (break), which derives from the Greek verb rig-nimi (break; ρήγ-νυμι) and its root frag- (Fραγ-). Η λέξη fracture (σπάσιμο, κάταγμα) προέρχεται από το λατινικό ρήμα frango/frangere (σπάω, ρήγνυμι), το οποίο με τη σειρά του προέρχεται από το ελληνικό ρήγνυμι και τη ρίζα του Fραγ-. The word borough and the widely used ending -burg derives from the Latin burgus (fortress, castle, fortified city), which is a transliteration of the Greek word pyrgos (burgus, fortress, castle; πύργος; see “Αίας πύργος Αχαιοίς”). Pyrgos is related to Pergamon (Πέργαμα Τροίας, Pergama Trias – citadel of Troy). Η λέξη borough (πόλη, δήμος) καθώς και η εκτενώς χρησιμοποιούμενη κατάληξη -burg προέρχεται από το λατινικό burgus (πύργος, κάστρο, οχυρωμένη πόλη), το οποίο αποτελεί μεταγραφή του ελληνικού πύργος. etymology of burgus, etymology of borough, etymology of -burg, etymology of -burgh, etymology of burglar, etymology of burgess, etymology of burgh, etymology of burgher, origin of burgus, origin of borough, origin of -burg, origin of -burgh, origin of burglar, origin of burgess, origin of burgh, origin of burgher, etym0ology of bourgeois, origin of bourgeois. Η λέξη topic (θέμα συζήτησης) προέρχεται από το Λατινικό topica, το οποίο αποτελεί μεταγραφή του Ελληνικού topica (τοπικά) από το τόπος. Bomb derives from the french bombe, from the latin bombus (a buzzing sound), which is a transliteration of the greek bombos (βόμβος). Bomb προέρχεται από το γαλλικό bombe, από το Λατινικό bombus, το οποίο αποτελεί μεταγραφή του Ελληνικού βόμβος.